The UK charity says Starbucks asked the National Coffee Association (NCA) to block the country's bid to trademark three types of coffee bean in the US. Oxfam says poor farmers would have benefited from the move but the NCA says there is no economic case to support the charity's claims. Starbucks denies initiating opposition to the trademark application. The Ethiopian government filed its applications to trademark its most famous coffee bean names - Sidamo, Harar and Yirgacheffe - in US courts last year. 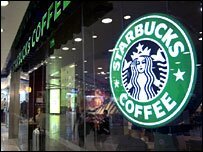 Oxfam claims that Starbucks flagged up the application to the NCA - of which the firm is a leading member. The NCA then filed its opposition at the US Patent and Trademark Office. Oxfam's Phil Bloomer said the charity had worked with Starbucks in the past and appealed to the firm to "act responsibly". "Their behaviour on this occasion is a huge backwards step and raises serious questions about the depth of their commitment to the welfare of their suppliers," he said. Berhanu Kebede, Ethiopia's ambassador to the UK, said in a statement that the international community should support the country's efforts to ensure farmers got a fair reward for their hard work. "This campaign has a pivotal role in redressing the unfairness of the international trading system," he said. Starbucks' senior vice-president of coffee procurement, Dub Hay, denied approaching the NCA to oppose the Ethiopian move. "We did not get the NCA involved - in fact it was the other way around, they contacted us." Robert Nelson, head of the NCA, backed Mr Hay's claim, adding that his organisation opposed the Ethiopian move for economic reasons. "For the US industry to exist, we must have an economically stable coffee industry in the producing world," he said. "This particular scheme is going to hurt the Ethiopian coffee farmers economically." He claimed that the Ethiopian government was being badly advised, and the move would price them out of the market. The trademark move would also reduce demand for the country's coffee, he said. Oxfam said the NCA and Starbucks should not dictate to Ethiopia how best to sell its products. Madonna's "bending of the rules" in her haste to adopt 13-month-old David Banda is sending a message to child traffickers that Malawi is open for business, a southern African child welfare organisation said. Pop star Madonna, 48, who has an estimated fortune of US$462 million, was granted an interim adoption order last week in the High Court in the capital, Lilongwe, in contradiction of the country's laws, which state that "an adoption order shall not be made to any applicant who is not resident in Malawi". The baby was whisked to Madonna's English home on the second attempt, after the initial attempt to take him out of Malawi failed because he was not in possession of a passport. Pam Wilson, an adoption supervisor at Johannesburg Child Welfare Society, a South African nongovernmental organisation catering for children in need, told IRIN there were international systems in place, which Madonna appeared exempt from, and that child traffickers now knew "there are loopholes, and that is the message". According to Karen Blackman, of the counter-trafficking unit of the International Organisation for Migration (IOM), which monitors cross-border movements of people, "globally, adoption can provide a vehicle for traffickers if the laws are not followed correctly", but IOM had no evidence to suggest this was happening in Malawi. Wilson said baby David's adoption procedure appeared to have flouted international norms, and reports that Madonna, nicknamed the Material Girl, had chosen the child from a line-up were "terrible - it's like shopping", and "no one else has that privilege", or should have. Wilson, who oversees about 150 international adoptions annually in accordance with the Hague Convention, said a "well-known person", whom she declined to name, recently tried to adopt a child in South Africa, but had not adhered to the correct procedures and did not follow up after being informed of them. "I think that there is an element of rescuing a child [from the developing world]. It can be seen as trend with celebrities, who are adopting a lot." The Hague Convention facilitates the inter-country adoptions of children under the age of 16. Signatories to the convention secure the prompt return of children wrongfully removed to, or retained in, a contracting state and ensure residence rights issued in one country are implemented and respected in another. Malawi is not a signatory to the convention. The United Nations Children's Fund (UNICEF) said in a statement that it did not have adequate information to comment on the legality of the adoption, but that "inter-country adoption can be a positive solution for some children who are in need of families, for whom other permanent placement options within their own country are not available. However, any inter-country adoption should be subject to the same safeguards and scrutiny as domestic adoption, as well as a few additional protections." American actress Mia Farrow is recognised as starting the celebrity trend for foreign adoptions in 1973 and is now the mother of 14. Hollywood star Angelina Jolie is currently the most famous exponent, having adopted two children from the developing world: a daughter, Zahara, from Ethiopia, and a son, Maddox, from Cambodia. She recently had her own child with her partner, Brad Pitt. Inter-country adoption between convention signatories is a well-established practice, and the flow of children is almost always from developing countries to developed countries, Wilson told IRIN. In industrialised countries fewer babies are available because social welfare systems provide for single parents, and populations are ageing. Madonna's adoption is meeting resistance from the Human Rights Consultative Committee (HRCC) in Malawi, an umbrella body of civic organisations. According to committee chairman Justin Dzonzi, "the law in Malawi does not allow cross-border adoption". He said his organisation would pursue the matter in court, but other legal experts saw it as a case of shutting the stable door after the horse had bolted. "Practically, there is an implication, should the courts overturn the earlier decision to have Madonna adopt the child. In fact, she has the right to do so and in most cases the court will look at the interests of the child," said Necton Mhura, Dean of Law at Chancellor College, part of university of Malawi. Madonna's swift adoption is leading to calls for an overhaul of the adoption laws in one of the world's poorest countries, where three-quarters of its 12 million people live on less than US$2 a day, and about one million children are orphaned, primarily as a result of the HIV/AIDS pandemic. Samson Matewere, executive director of Eye of the Child, a child-rights activist group, said civil society organisations would lobby members of parliament "in the coming sitting of parliament to speed up the amendment to the adoption of children act". "Madonna has only been granted a temporary order to adopt the boy for 18 months and government will have to monitor the child. But the question is: has the government got the resources to monitor the child in the UK or USA? The child can only be monitored properly by a government where the child is. And also, when you look at the adoption laws in Malawi they are not in agreement with international adoption laws. We need to review them so that we allow international adoption," he said. According to the adoption act, any person considering adopting a child should be resident in the country for a minimum of 18 months. Madonna was in Malawi for about nine days. A spokesperson for the opposition United Democratic Front party, Sam Mpasu, said the law should be reviewed to allow international adoption. "What is the fuss all about? This is a child whose father has agreed to have Madonna adopt him. People are jealous of the child." Father of the child Yohane Banda, whose wife died during childbirth, was quoted in Britain's Mail on Sunday as saying, "The government people told me it would be a good thing for the country. He will come back educated and able to help us."